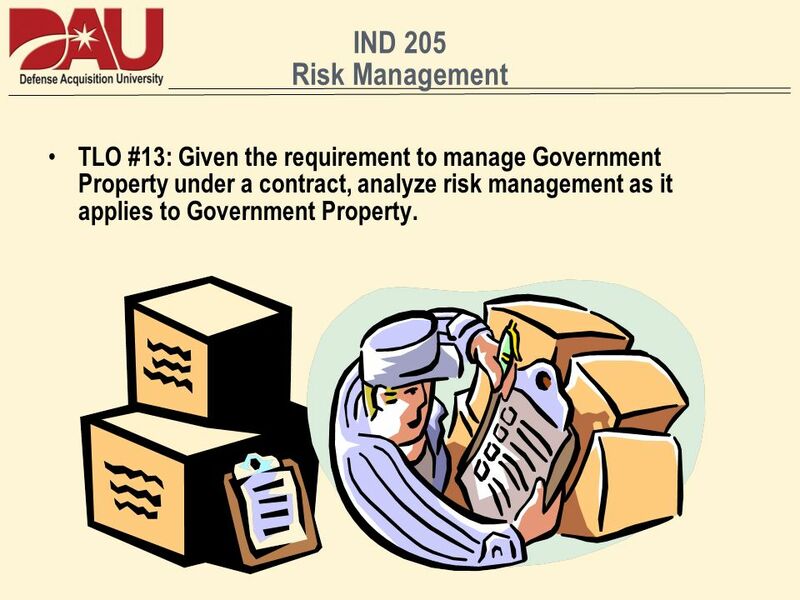 2 IND 205 Risk Management TLO #13: Given the requirement to manage Government Property under a contract, analyze risk management as it applies to Government Property. What is the RISK to the Government? ELOs: 1. Discuss a risk associated with the Contractor not complying with FAR 2. 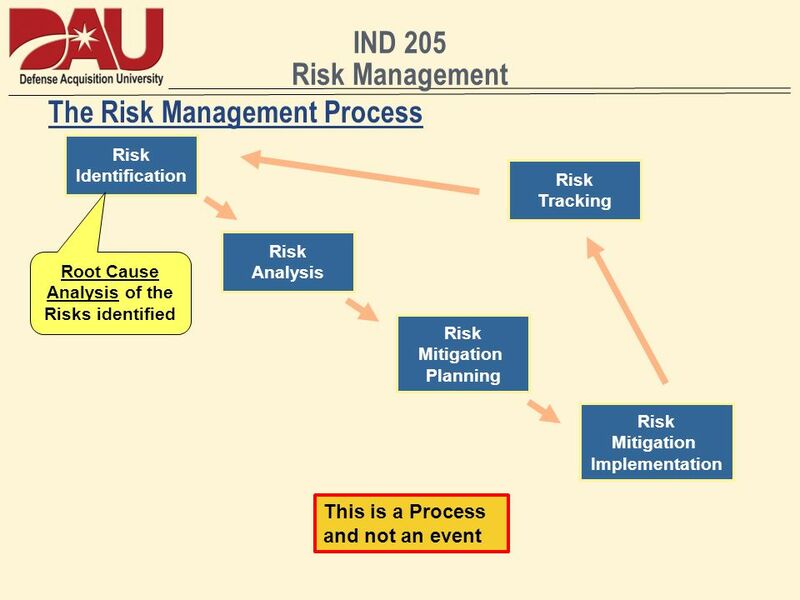 Outline the Risk Management Process (Identification, Analysis, Mitigation Planning, Mitigation Implementation, & Tracking) with respect to Government Property. 3. 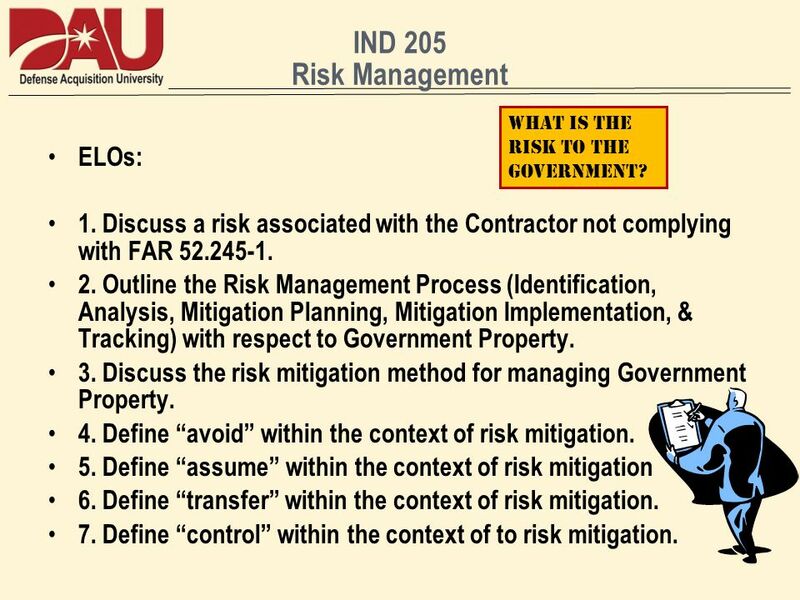 Discuss the risk mitigation method for managing Government Property. 4. Define “avoid” within the context of risk mitigation. 5. Define “assume” within the context of risk mitigation 6. Define “transfer” within the context of risk mitigation. 7. 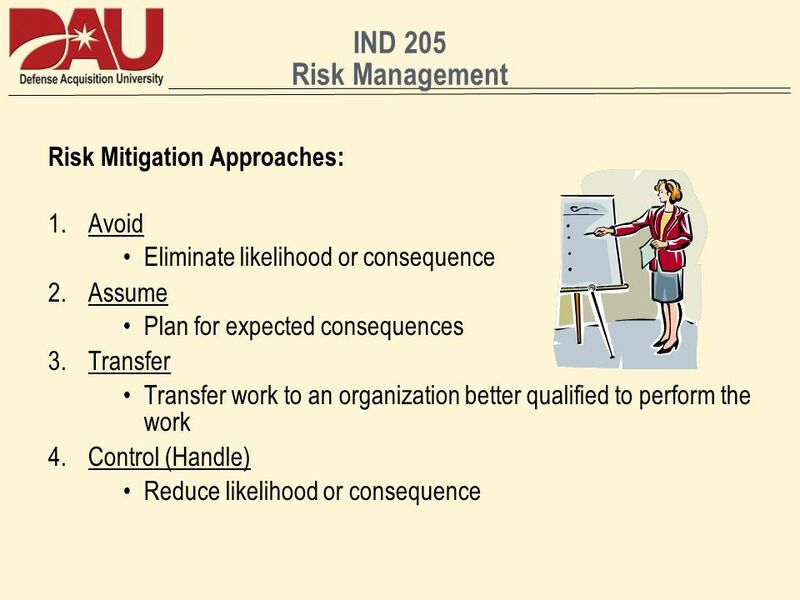 Define “control” within the context of to risk mitigation. 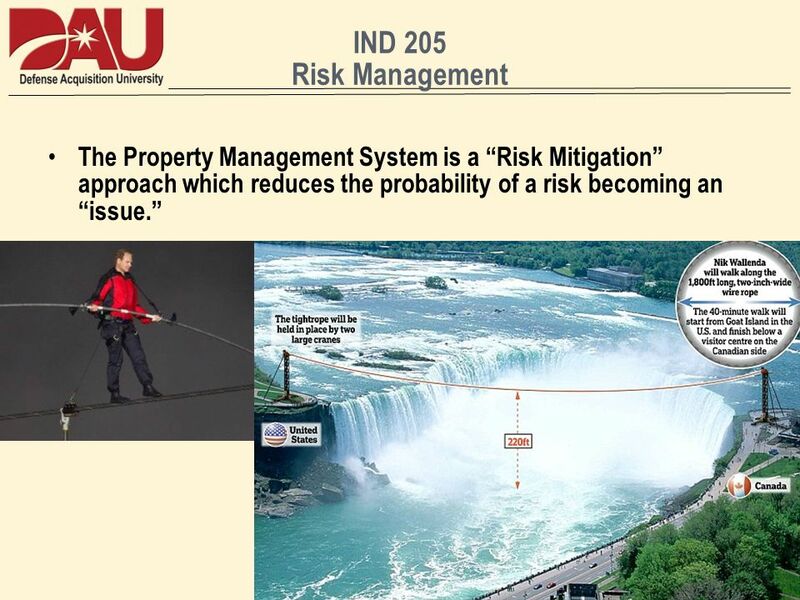 5 IND 205 Risk Management What is Risk? 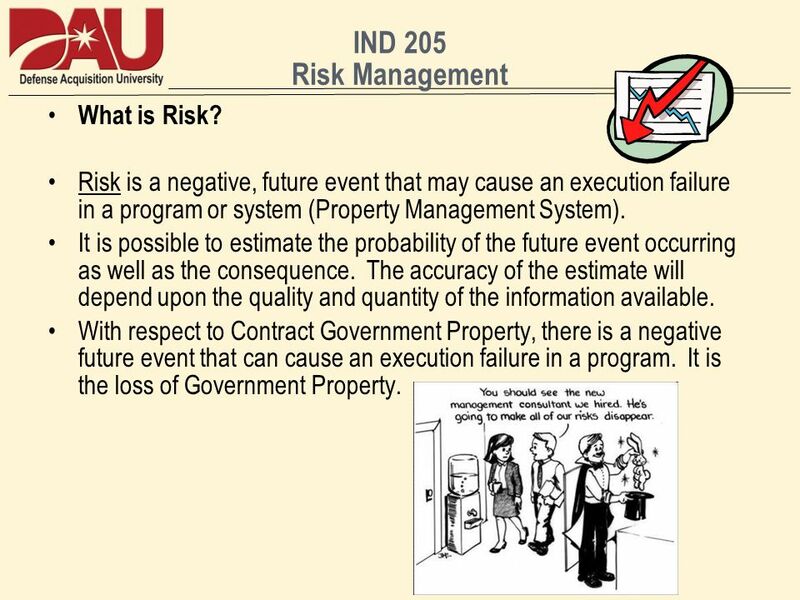 Risk is a negative, future event that may cause an execution failure in a program or system (Property Management System). It is possible to estimate the probability of the future event occurring as well as the consequence. The accuracy of the estimate will depend upon the quality and quantity of the information available. With respect to Contract Government Property, there is a negative future event that can cause an execution failure in a program. It is the loss of Government Property. 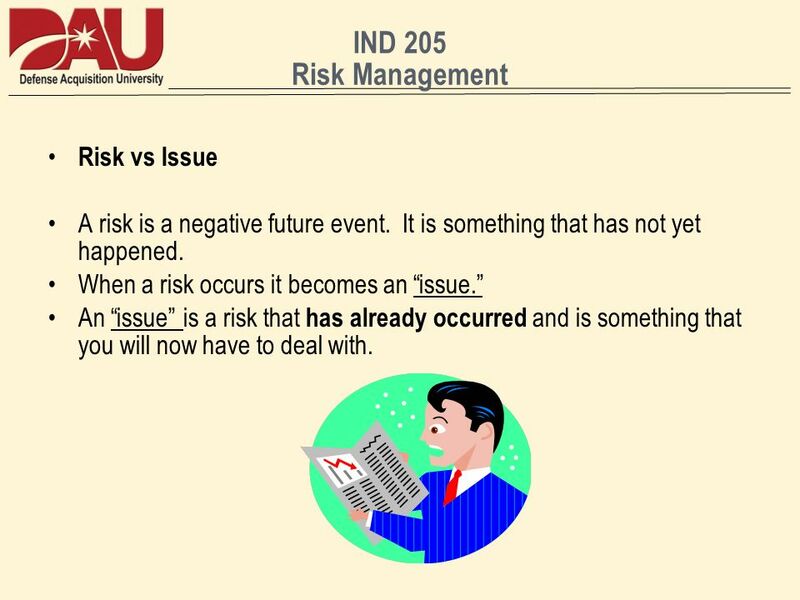 A risk is a negative future event. It is something that has not yet happened. When a risk occurs it becomes an “issue.” An “issue” is a risk that has already occurred and is something that you will now have to deal with. 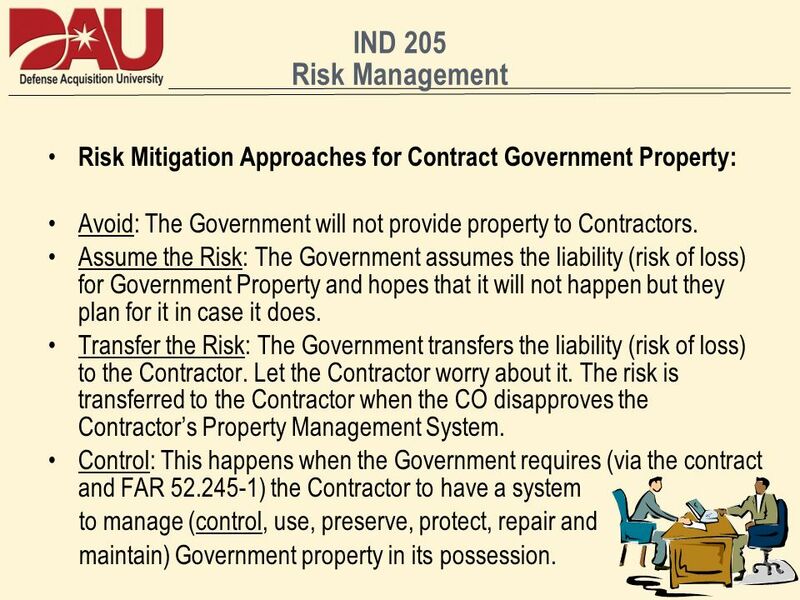 10 IND 205 Risk Management Risk Mitigation Approaches for Contract Government Property: Avoid: The Government will not provide property to Contractors. 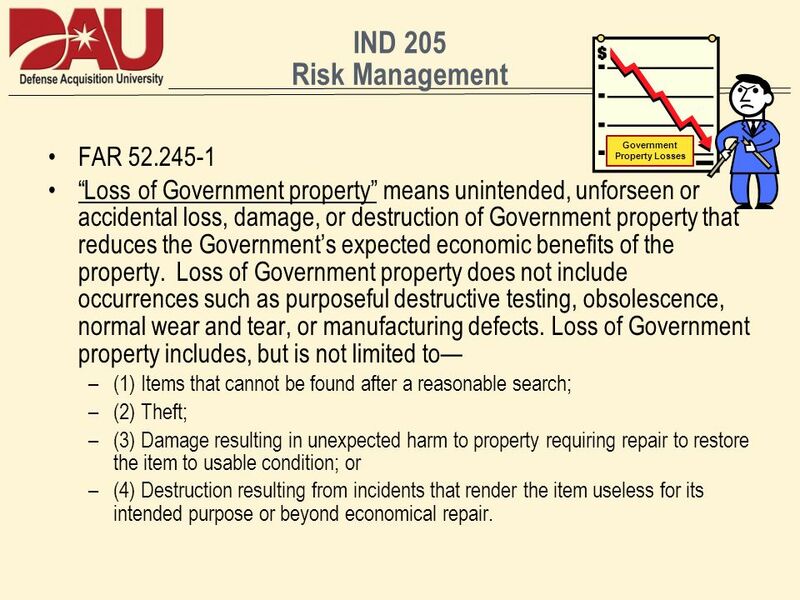 Assume the Risk: The Government assumes the liability (risk of loss) for Government Property and hopes that it will not happen but they plan for it in case it does. Transfer the Risk: The Government transfers the liability (risk of loss) to the Contractor. Let the Contractor worry about it. 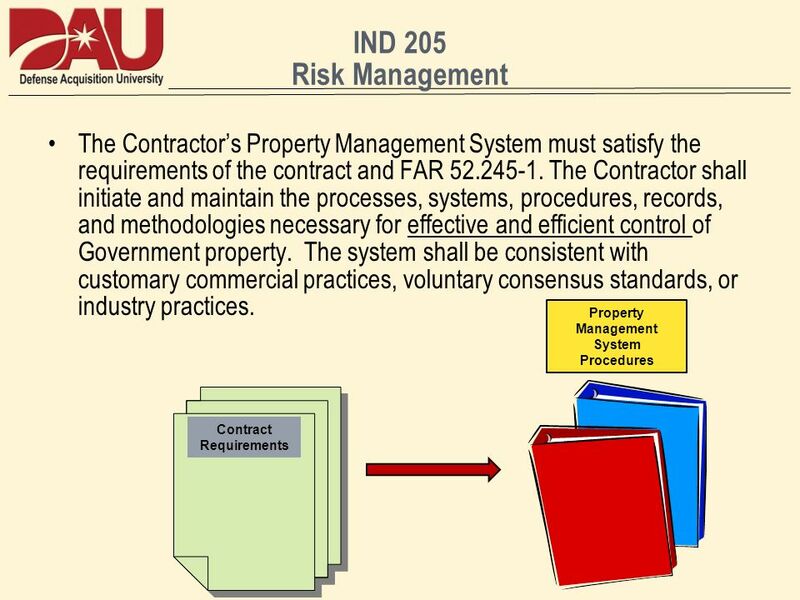 The risk is transferred to the Contractor when the CO disapproves the Contractor’s Property Management System. Control: This happens when the Government requires (via the contract and FAR ) the Contractor to have a system to manage (control, use, preserve, protect, repair and maintain) Government property in its possession. 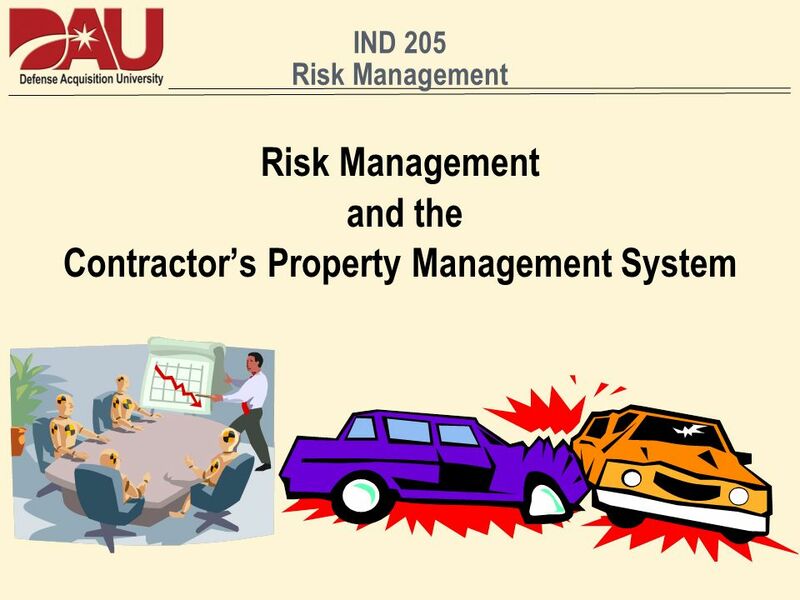 11 IND 205 Risk Management The Contractor’s Property Management System is really a Risk Mitigation System. It is a way to reduce the risk of loss of Government Property when it is in the contractor’s possession. 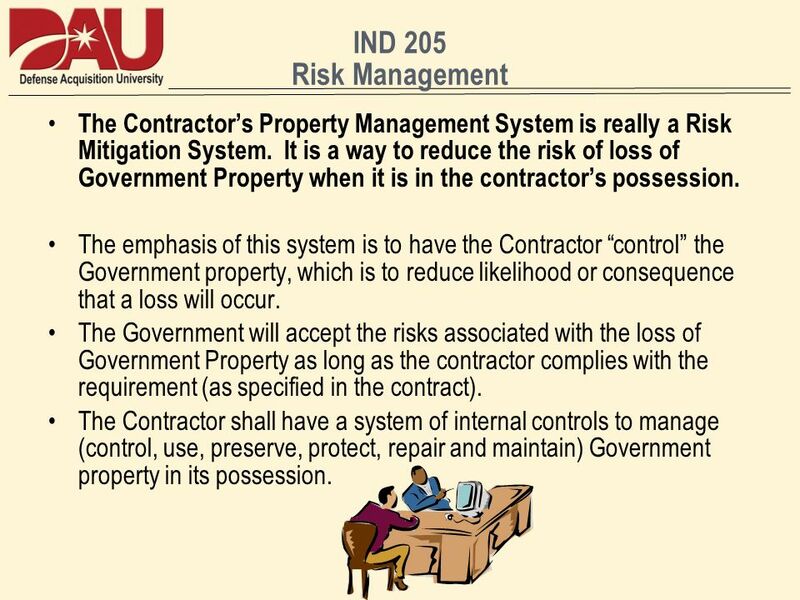 The emphasis of this system is to have the Contractor “control” the Government property, which is to reduce likelihood or consequence that a loss will occur. The Government will accept the risks associated with the loss of Government Property as long as the contractor complies with the requirement (as specified in the contract). 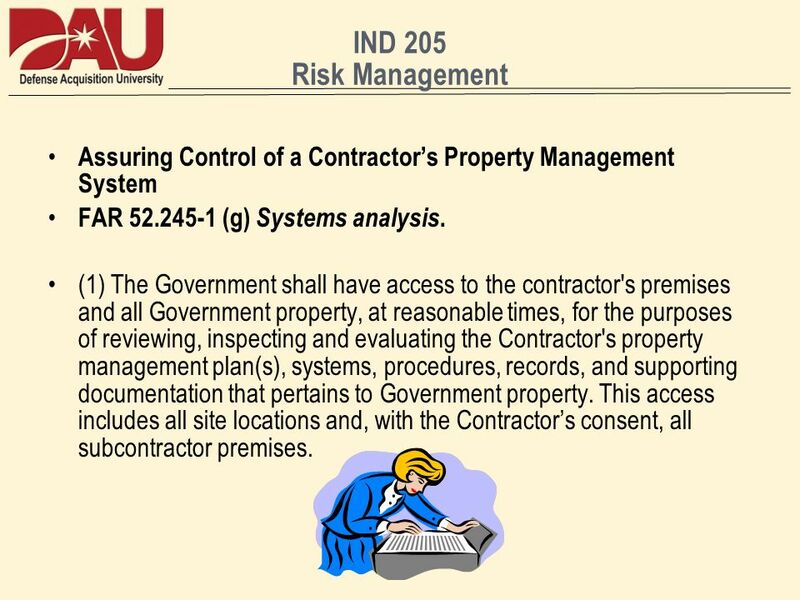 The Contractor shall have a system of internal controls to manage (control, use, preserve, protect, repair and maintain) Government property in its possession. 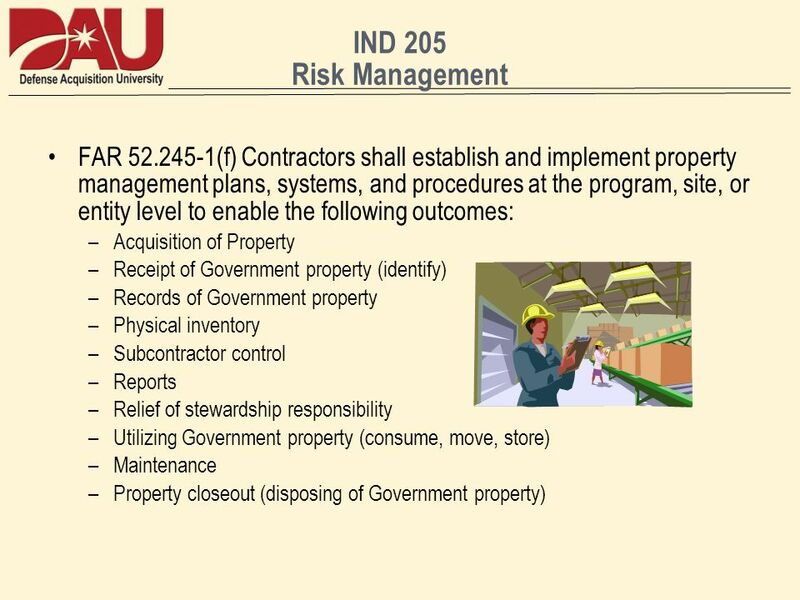 14 IND 205 Risk Management Assuring Control of a Contractor’s Property Management System FAR (b) The Contractor shall establish and maintain procedures necessary to assess its property management system effectiveness, and shall perform periodic internal reviews surveillances, self assessments, or audits. Significant findings or results of such reviews and audits pertaining to Government property shall be made available to the Property Administrator. 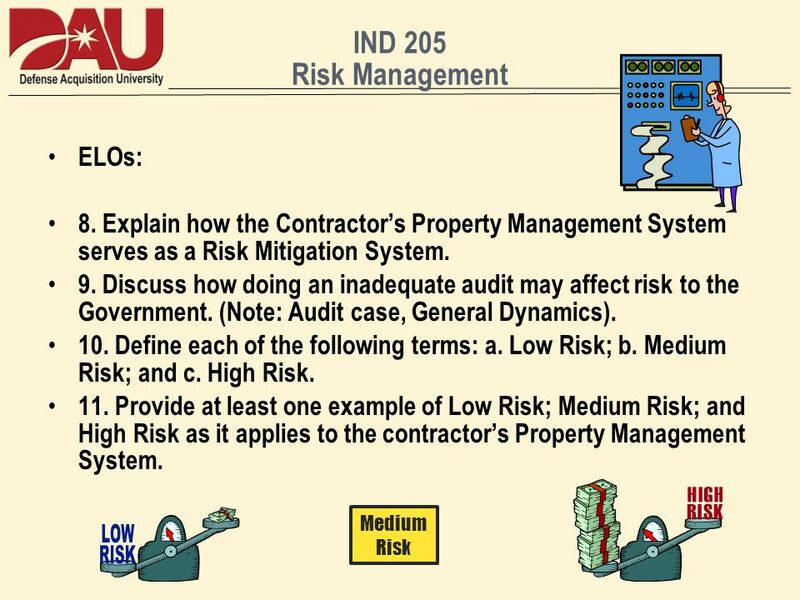 15 IND 205 Risk Management Assuring Control of a Contractor’s Property Management System FAR (g) Systems analysis. (1) The Government shall have access to the contractor's premises and all Government property, at reasonable times, for the purposes of reviewing, inspecting and evaluating the Contractor's property management plan(s), systems, procedures, records, and supporting documentation that pertains to Government property. This access includes all site locations and, with the Contractor’s consent, all subcontractor premises. 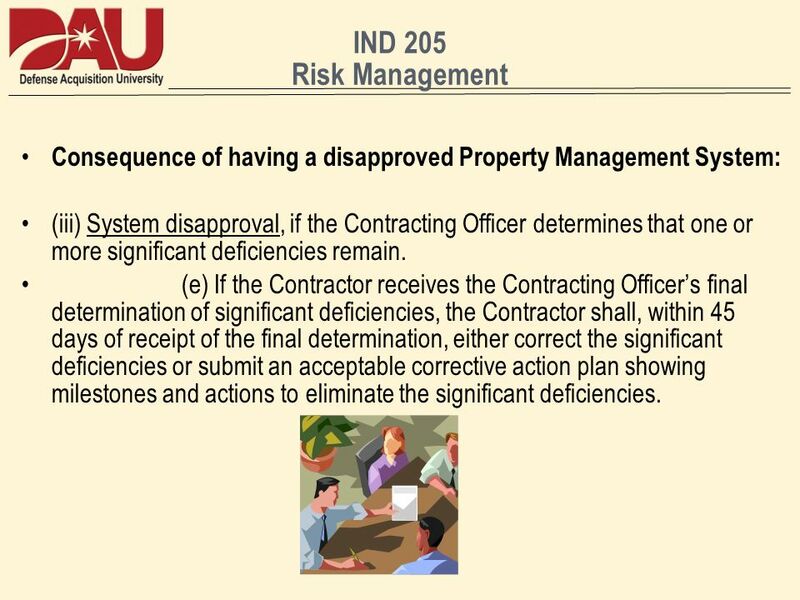 16 IND 205 Risk Management Consequence of having a disapproved Property Management System: (iii) System disapproval, if the Contracting Officer determines that one or more significant deficiencies remain. (e) If the Contractor receives the Contracting Officer’s final determination of significant deficiencies, the Contractor shall, within 45 days of receipt of the final determination, either correct the significant deficiencies or submit an acceptable corrective action plan showing milestones and actions to eliminate the significant deficiencies. 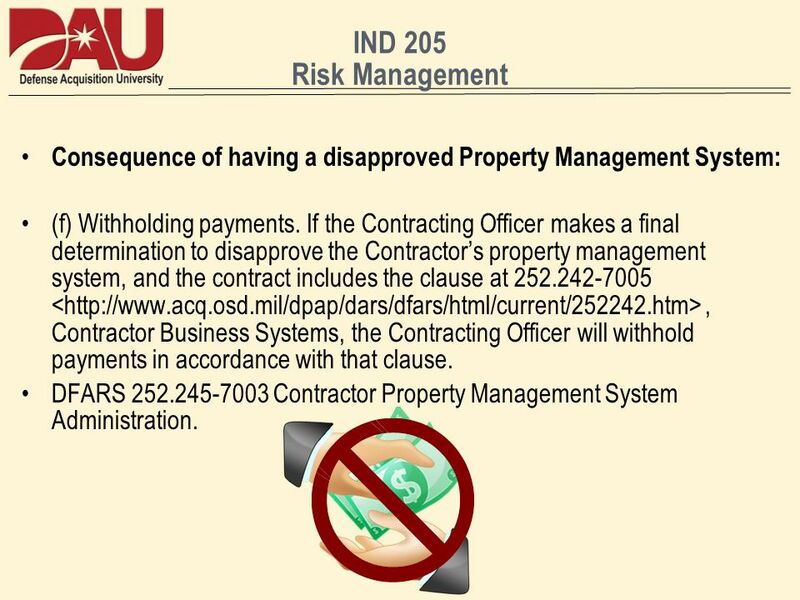 17 IND 205 Risk Management Consequence of having a disapproved Property Management System: (f) Withholding payments. If the Contracting Officer makes a final determination to disapprove the Contractor’s property management system, and the contract includes the clause at < , Contractor Business Systems, the Contracting Officer will withhold payments in accordance with that clause. DFARS Contractor Property Management System Administration. 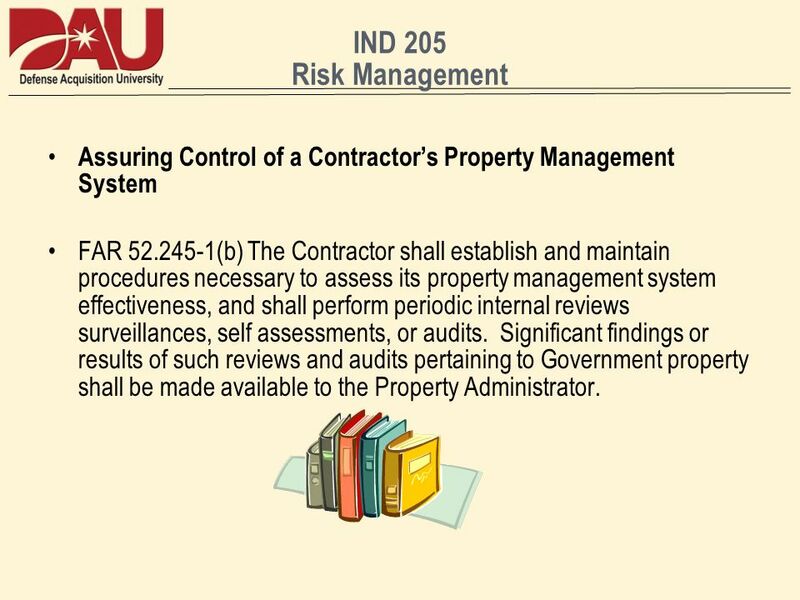 Download ppt "Risk Management and the Contractor’s Property Management System"
It the responsibility of the executive head of your state agency to maintain the property records of those assets under the control of the agency. This. I n t e g r i t y - S e r v i c e - E x c e l l e n c e 17 th Contracting Squadron 1 Termination of Commercial Contracts. Three Rivers Chapter NPMA Mike Walsh Property Administrator Gold Belt Eagle August 15, 2012. St. Hugh Catholic School Student iPad Use Liability Agreement. FAR Part 44: Subcontracting Policies & Procedures February 5, 2012. Completion Outstanding work and Remedying Defects In order that the Works and Contractor's Documents, and each Section, shall be in the condition required. 11 Basic Property Management- Government Part II Meeting the needs of all our “customers” while implementing effective processes….. Two of the biggest.